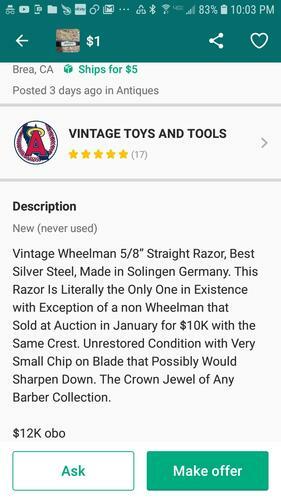 Found a listing for a Solingen Best Silver Steel. 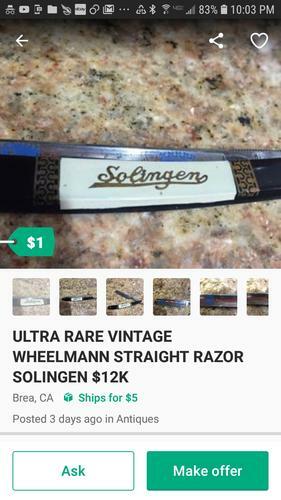 Guy says it and another that sold on eBay for $10,000 are the only two Solingen made Best Silver Steel existence. He has talked to the buyer who paid the full Buy It Now price of $10,000. Nope! You aren't missing a single thing. P.T. Barnum said it years ago. rolodave, BobH, Hanlon and 5 others like this. There are loads of micro producers that existed back in the day and probably none of their razors exist but even if one or two did the only person who would pay that price is someone who was willing to pay that price to get the only example left in the whole wide world. As the song goes "it ain't me babe". cudarunner and Hanlon like this. cudarunner, 32t, celticcrusader and 17 others like this. 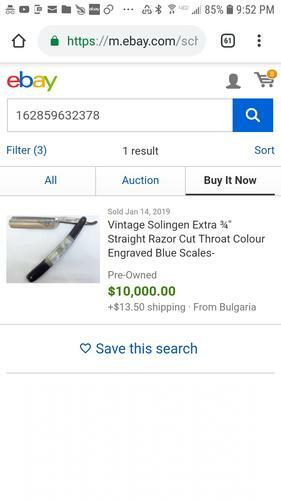 I keep trying to make sense of why that razor sold so high.. The thoughts that come to mind are mostly standard, but then I thought maybe there's more to it.. Maybe they are sending money for another reason..? Definitely more intrigue in that thought! Geezer, Phrank, MikeB52 and 2 others like this. "Sold at auction in January for 10K"
Hanlon and MikeT like this. Picture? Would love to see it! Mine is a Bismarck, but I'll get a pic or two later.